HUMBLE, TX--(Marketwired - Dec 1, 2014) - While the holidays are the most wonderful time of year, preparing for them can feel decidedly less so. But coming to the rescue of celebrants everywhere is the Fairfield Inn Houston Humble, whose cozy hospitality and convenient access to the area's best mall make it the perfect place for squeezing in a little holiday shopping while relaxing on a winter getaway. Located among hotels in North Houston, TX, this property puts guests less than a mile from Deerbrook Mall, the area's premier retail outlet. Anchored by Macy's and Dillard's, the mall includes shops for men, women, children and every interest, whether it's technology at Best Buy Mobile, books at Barnes & Noble or teddy bears at Build-A-Bear. More than 20 other stores and more than 30 restaurants are also nearby for browsing to ensure that shoppers find something for everyone on their lists. Guests who can count on their partners to handle the shopping, meanwhile, will find plenty of other entertainment at this hotel in Humble, TX. A movie theater and bowling alley are just a few miles away, promising plenty of family fun. Also close by are a shooting range and two golf courses for those eager to practice their skills, while the area's museum and theater districts are just as easily accessible for a cultural adventure. As the most value-added option among hotels near Deerbrook Mall, the Fairfield Inn Houston Humble helps shoppers be generous in their gift-giving. With features like complimentary hot breakfasts each day and free Wi-Fi in the guest rooms and public spaces, the hotel lets visitors save money and enjoy a comfortable stay. Guest rooms, after all, are spacious and welcoming with LCD HD televisions, and the indoor pool and whirlpool provide perfect ways to unwind after a day of playing Santa. With plenty of options for enjoying the holidays, whether it's sightseeing or wrapping up the shopping, a stay at at this standout option among hotels in Houston, TX may just be the best present of the season. 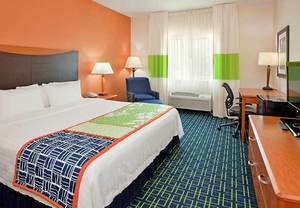 Guests arriving at the Fairfield Inn Houston Humble find themselves ideally positioned to both work and play. Located near Bush Intercontinental Airport as well as the area's major corporate offices, the hotel welcomes business travelers with onsite fax, copy and delivery services. Plus the guest rooms feature spacious work desks, ergonomic chairs and free Wi-Fi to help visitors stay productive. Other guest room features include free premium cable (the perfect companion to the rooms' LCD HD televisions), coffee and tea service and irons and ironing boards. And complimentary daily breakfasts give guests the energy they need to explore the surrounding area, whether it's the shopping and dining at Deerbrook Mall or the majestic nature at Lake Houston Wilderness Park. Visit the Fairfield Inn Houston Humble and enjoy some winter retail therapy at the Deerbrook Mall located nearby.